No change in the signals as we start the week. The ADX, Price & Volume, and OEW all remain in an uptrend. 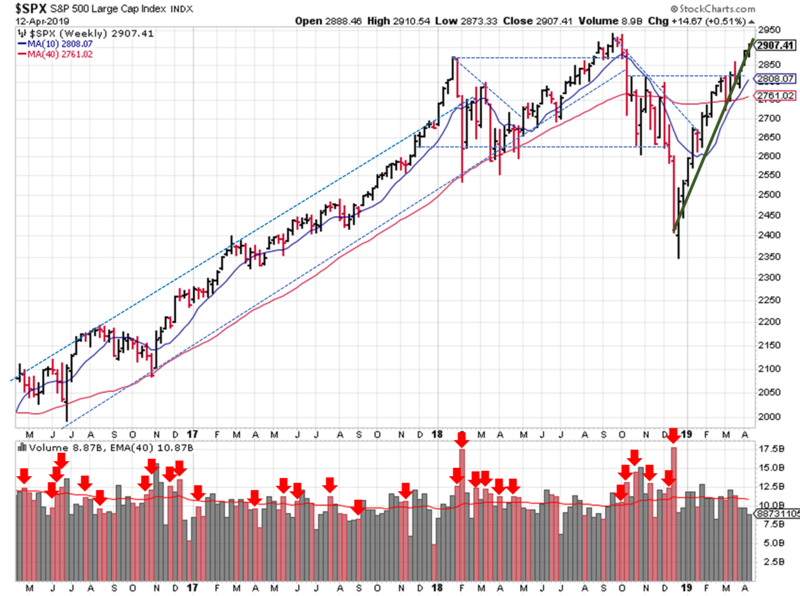 A weekly view of the S&P shows the late December uptrend was violated last week, but not by much. The index needed to close at 2,925 or higher, but instead closed at 2,905. We’ll have to see if prices can recover this week. The declining volume doesn’t instill much confidence in the run towards new highs, but a holiday shortened week clouds the issue. In the daily view, the S&P 500 ($SPX) remains within the uptrend channel. And we can see an uptick in trading volume as prices hit 2,900…contradicting the weekly view. If you find this research helpful, please forward to a friend. If you don’t find it helpful, tell an enemy. I share articles and other news of interest via Twitter; you can follow me @investsafely. The weekly market outlook is also posted on Facebook and Linkedin. If you’re interested in learning more about the relationship between price and volume, or how to find and trade the best stocks for your growth strategy, check out this book on Amazon via the following affiliate link: How to Make Money in Stocks: A Winning System in Good Times and Bad. It’s one of my favorites. The S&P 500 Composite Total Return Index (the “S&P”) is a market capitalization-weighted index of 500 widely held stocks often used as a proxy for the stock market. Standard & Poor’s chooses the member companies for the S&P based on market size, liquidity, and industry group representation. Included are the common stocks of industrial, financial, utility, and transportation companies. The S&P is not an index into which an investor can directly invest. The historical S&P performance results (and those of all other indices) are provided exclusively for comparison purposes only, so as to provide general comparative information to assist an individual in determining whether the performance of a specific portfolio or model meets, or continues to meet investment objective(s). The model and indices performance results do not reflect the impact of taxes. 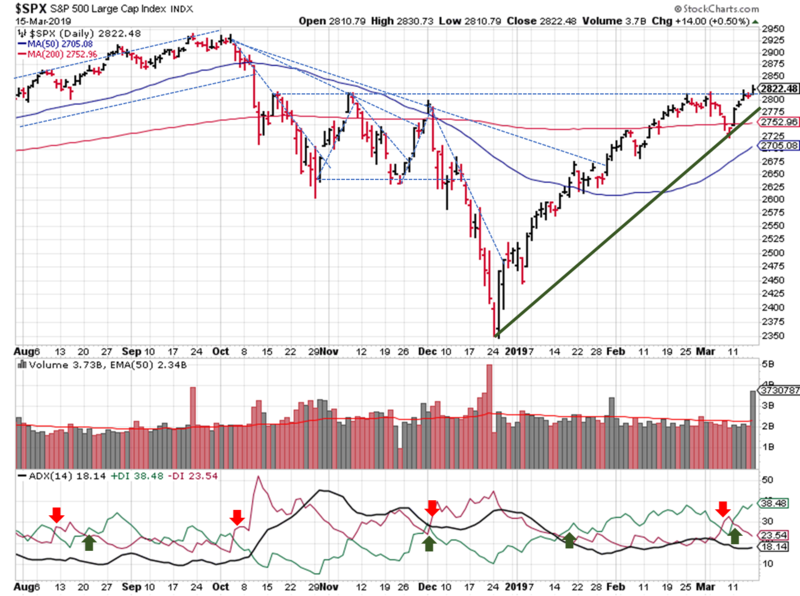 The S&P starts this week less than 2% off the all time high, and all signals (ADX, Price/Volume, and OEW) are green. A weekly view of the S&P’s shows the late December uptrend remains intact. 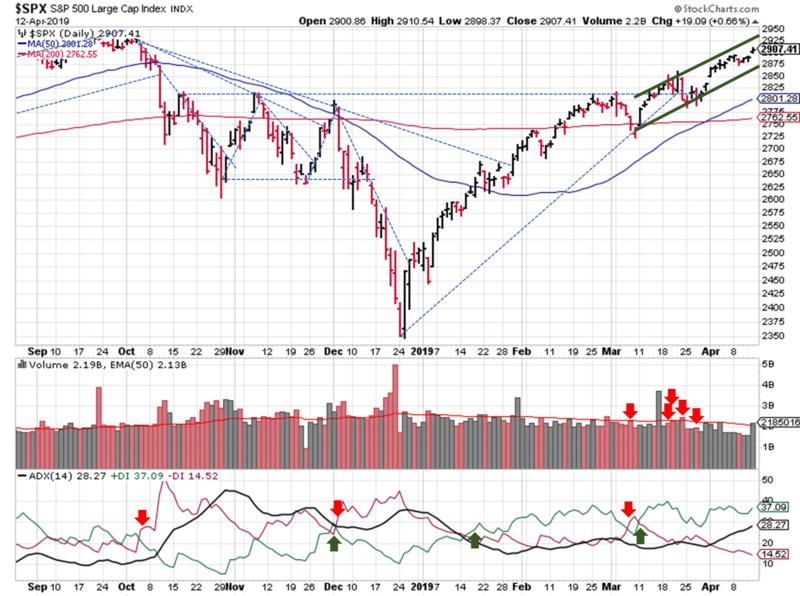 The index will need to end this week above 2925 or so to keep the weekly trend intact. In the daily view, the S&P500 ($SPX) starts this week in the middle of our fledgling channel, and another distribution day fell outside the 25 day window. Given the drastic changes in market price over the past 6 months, and the relative “calm” in market prices right now, take the opportunity to review your holdings. Double check your allocations verses your strategies and make sure that your money and goals are aligned. No April Fool’s joke this year. Market prices powered higher last week, leaving little reason to doubt new all time highs shortly. The ADX DI+ / DI- remains in bullish/uptrend territory. Price/volume shifts back to an uptrend. And the OEW group continues with their uptrend call. In the weekly view, the S&P’s shows the late December remains intact. I also highlighted all the weeks of heavy selling, going back to mid-2016 (rather than just the last year). You can see a fairly even smattering of “distribution weeks” (if there is such a thing) throughout 2016 and the first half of 2017. Then, it switched to feast or famine; either the market sold off hard every other week, or there was very little selling to speak of. I haven’t back-tested the performance impact from this observation. 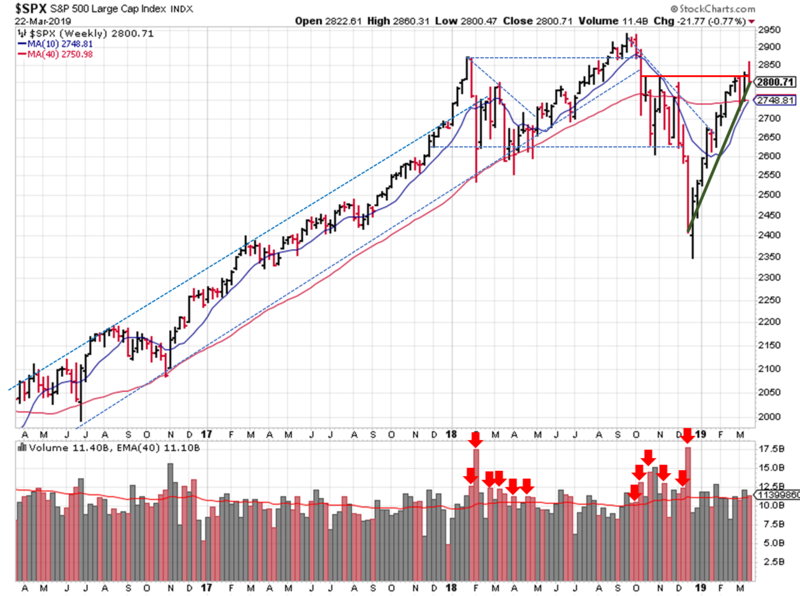 I just assume that a sell off now and then is health for market prices, and noticed the S&P hasn’t had a “distribution week” since the market bottom 15 weeks ago. Switching to a daily view, the S&P500 ($SPX) starts the week in what appears to be a new uptrend channel. In contrast with the weekly view, the daily view shows the late December uptrend did end a couple weeks ago. Nevertheless, the daily confirms the break above those 2018 Q4 highs. 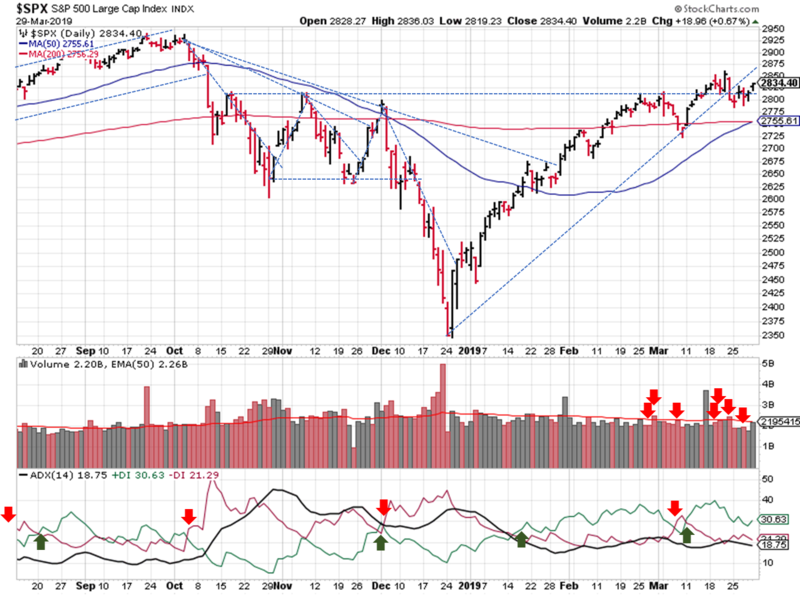 2 distribution days fell off the count, so the price/volume signal shifts from mixed to an uptrend. Generally speaking, the various averages showed a lot of strength last week. Even the Russell 2000 joined in, after closing below its 50-day moving averages two weeks ago. In the weekly view, the S&P’s 10 & 40 week moving crossed over (bullish), but didn’t do much to confirm anything from a trendline perspective. Undoubtedly, you’ve read a lot about the correlation between yield curve inversion and recession. Head over to The Fat Pitch blog to read a bit about the historical correlation between the price moves seen during Q1 and market performance over the rest of the year. Neither datasets are fool proof, but it pays to evaluate your process in light of both. We touched on the possibility for weak price action last week, and that’s exactly what we got. An inverted yield curve (ever so slightly, but it did invert) raised the specter of recession again. Dovish Fed statements and the prospect of QE-lite later this year, once reassuring, now seems to be confirmation they are also expecting weakness this year. 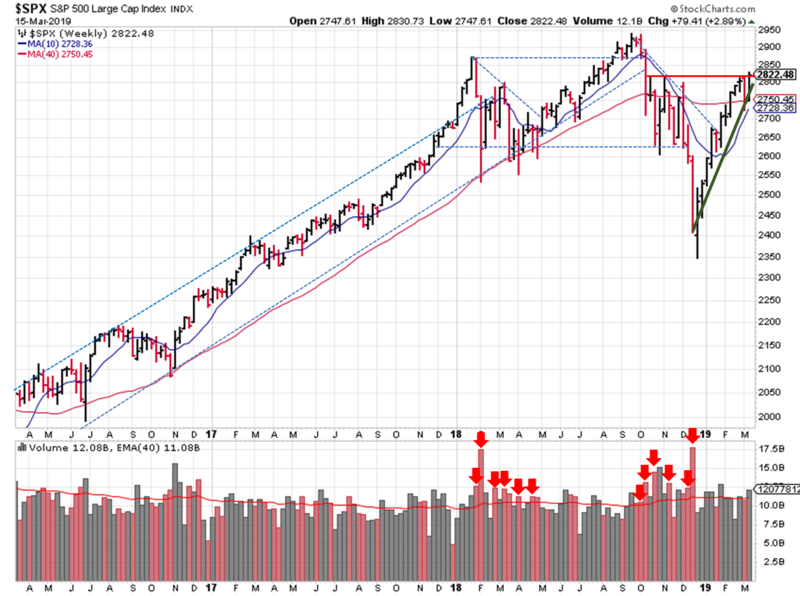 In the weekly view, the S&P retreated from the key resistance level pointed out last week and closed “on” the uptrend. 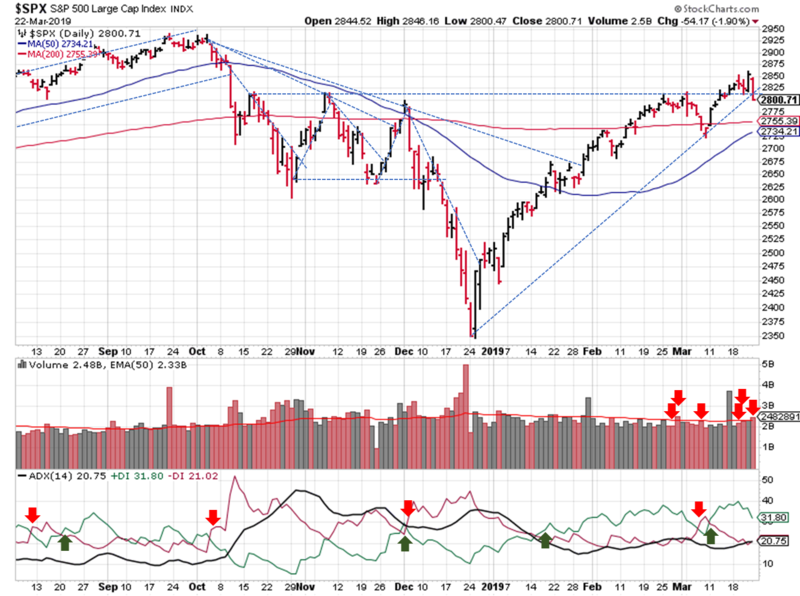 The 10 / 40 week averages are about to cross-over as well, which is usually a bullish sign. Switching to a daily view, the S&P500 ($SPX) starts the week in the worst possible location if you’re trying to confirm the recent trendlines: a few points below the resistance trendline going back to Q4 of last year AND the recently confirmed uptrend. Not enough to say we’ve found or broken key support levels, but just enough for everyone to validate their opinion. The DI+ / DI- remains in bullish territory. Price/volume weakened from uptrend to mixed, as the high-volume gains we were looking for didn’t materialize. Instead, the S&P picked up 3 more distribution days…a clear sign of institutional selling. Price is still above the 50-day moving average. The OEW group continues to see an uptrend with sideways/corrective price action in the short-term. The Russell 2000 plunged on Friday, and starts this week below the 50-day moving average. 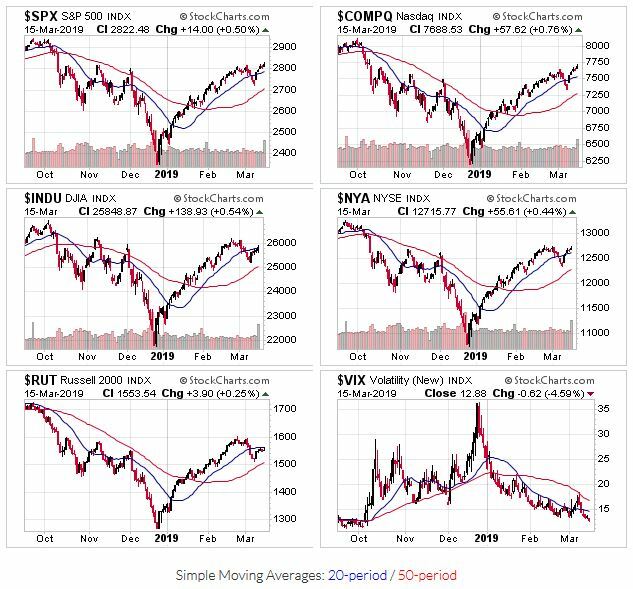 It’s in the worst technical shape of the major indexes, which is concerning since it typically serve as a leading indicator for “growth” investing (small, innovative companies are the engine that drives that type of strategy). 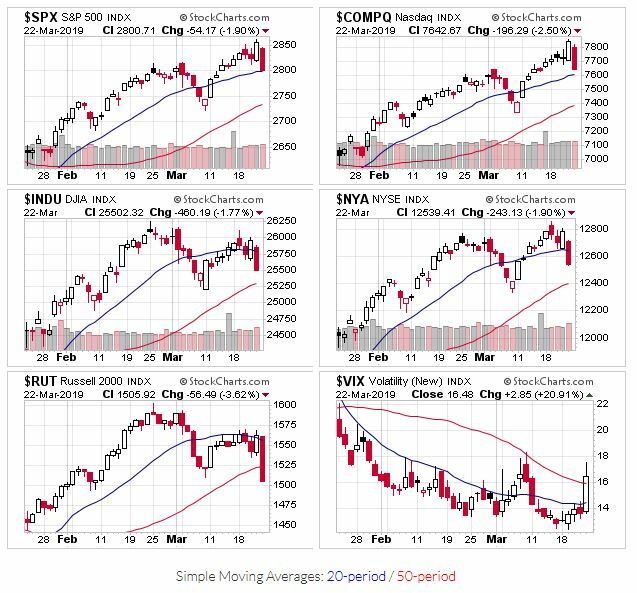 Many of the “growth investing” stocks that I watch struggled during the week and then got pummeled on Friday. Recent breakout candidates are either re-entering their bases or struggling to stay above their 7-8% stop loss levels. We had a good run since the start of the year, now may be a good time to book gains…especially if they’re >20%. 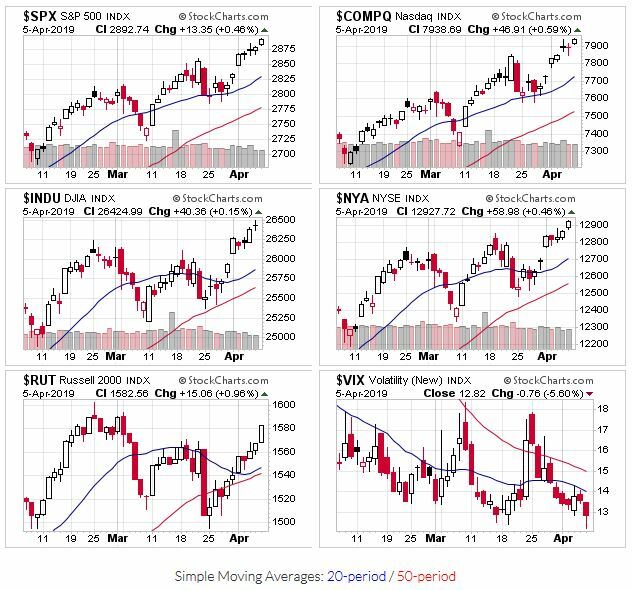 Uptrend signals across the board this week. In the weekly view, the S&P starts this week right at a key resistance level. And we have a lower weekly close to use as a reference point for an uptrend. It’s a steep trendline…you have to wonder how long it can be maintained. Switching to a daily view, the S&P500 ($SPX) recovered from a very brief trip below the 200-day moving average. Prices start the week just above a resistance trendline going back to Q4 of last year. 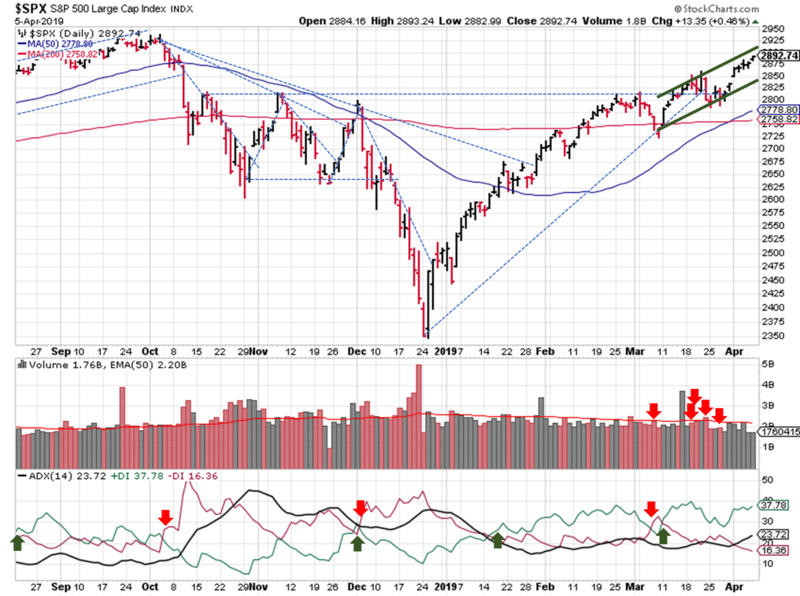 The index needs a high-volume gain this week to change the 2810’s from resistance to support. The DI+ / DI- starts the week in bullish territory, having briefly flipped to bearish last week. Price/volume still signals an uptrend. The OEW group maintained an uptrend call for this week, through the near-term potential for sideways/corrective price action remains. The DJIA and Russell 2000 haven’t shown the same strength as the NASDAQ and S&P; this difference is part of the reason OEW touched on the possibility for “weak” price action.